Brows. Oh so important and rather controversial. We have the un kept, the over plucked, natural, tattooed, the ombre and many many more. Each to their own I say (except over plucked - why have 2 thin lines?). Anyway I love a good brow product and once I found something that works I stick with it, for years now I have been using the Illamasqua brow cake in thunder with their angled brush. Along with this I had been using the Maybelline brow drama but more recently I discovered the l'oreal brow plumper which I love. I was starting to think there must be something new out there to try to got myself to cult beauty for a ABH order. 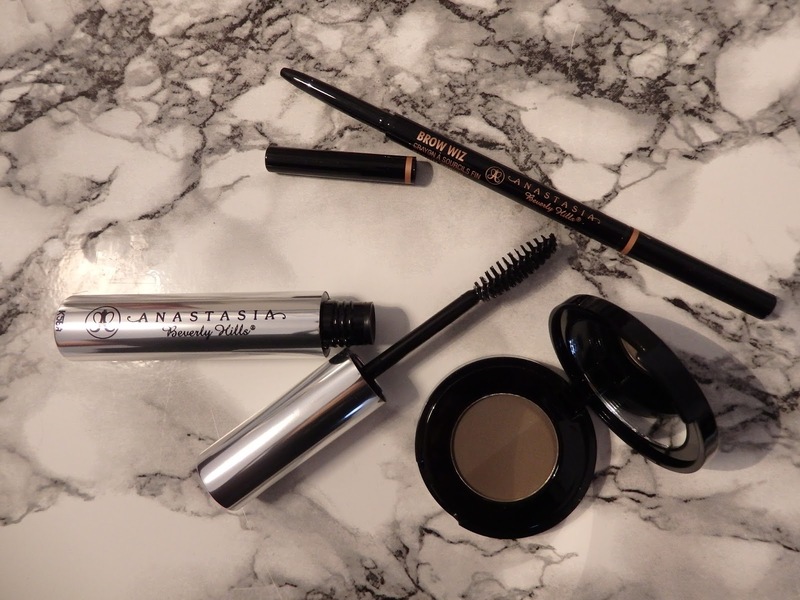 I had been curious about their products for awhile now, especially the brow wizz as I have always found brow pencils don't pack enough punch for my fair and sparse brows. In the end iIwent for the brow wiz in medium ash, the brow powder in ash brown and the clear brow gel. Illamasqua brow cake £17.50 4.5 grams. ABH brow powder - £17.00 1.60 grams. Let's have a bit of mental arithmetic here shall we, how much would you need to spend on ABH to get the same amount of product as Illamasqua? YES THAT'S £47.79 - how much you would need to spend on ABH to get the same amount you pay £17.50 for at Illamasqua. Case closed. 4/10 In my opinion the Illamasqua does the same job for much better value and slightly better colour pay off. It's a no brainer. I really don't have much to say here. It's a clear brow gel. I was foolish to buy it. Collection do one for £2.